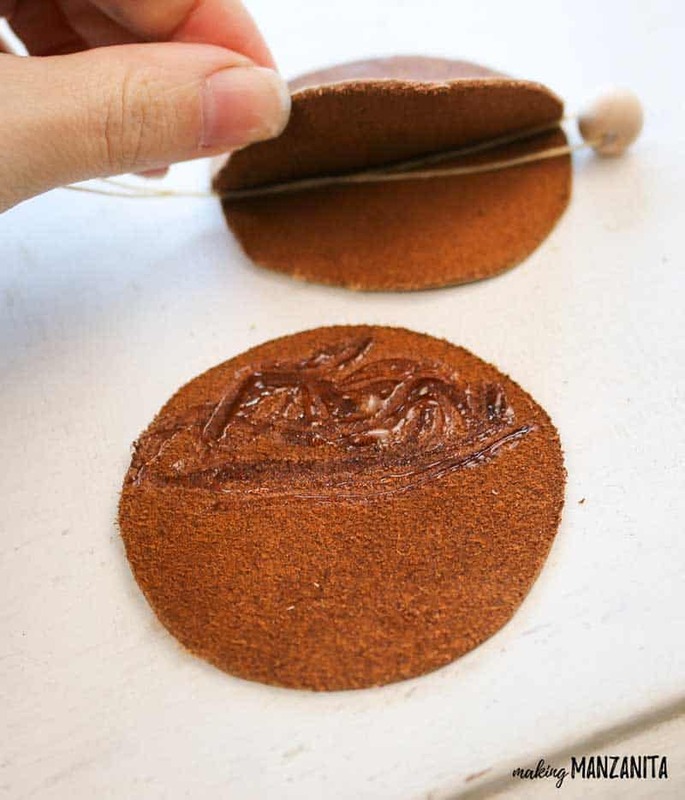 These easy leather Christmas ornaments couldn’t be more simple. 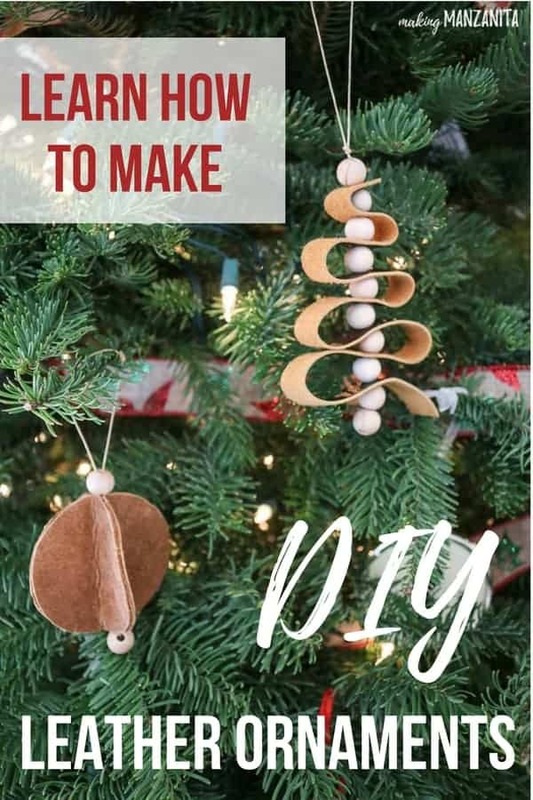 See how scrap recycled leather turns into super cute modern farmhouse Christmas ornaments to decorate your tree or give as Christmas gifts to your friends and family. 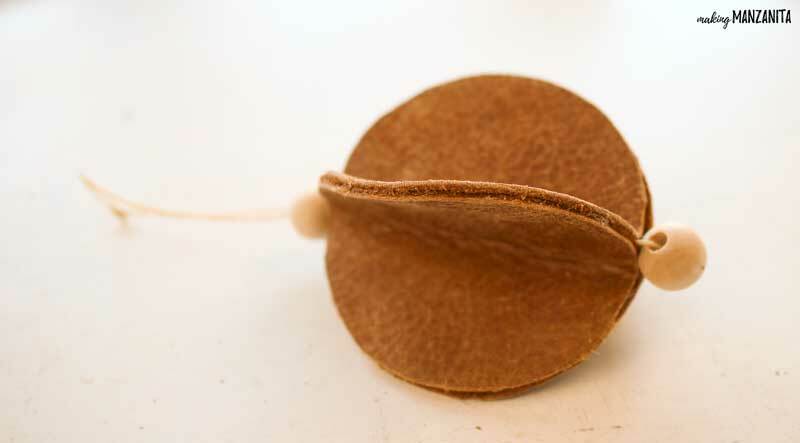 Yesterday I shared with you this leather ornament tutorial. Isn’t that mini tree with wood beads so adorable? 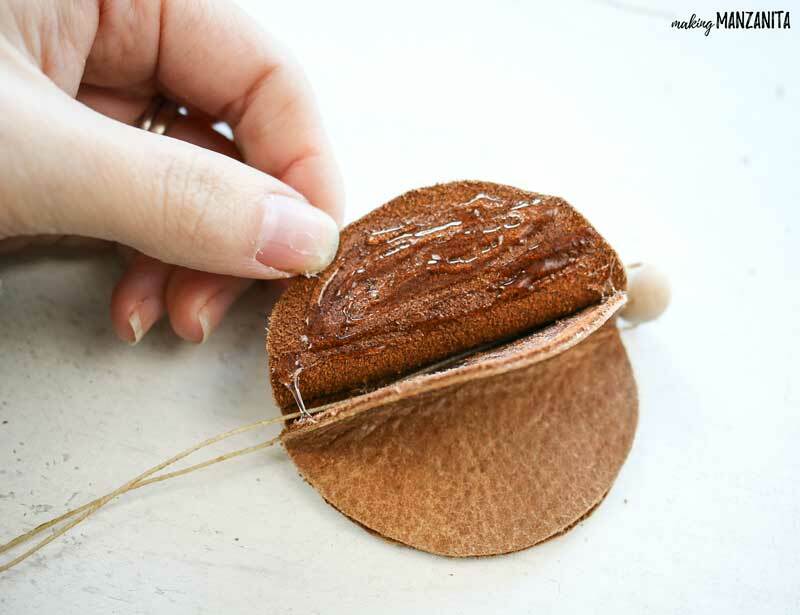 I mentioned that I had one more leather Christmas ornament up my sleeve and today I’m sharing how to make this ornament with leather circles and wood beads. 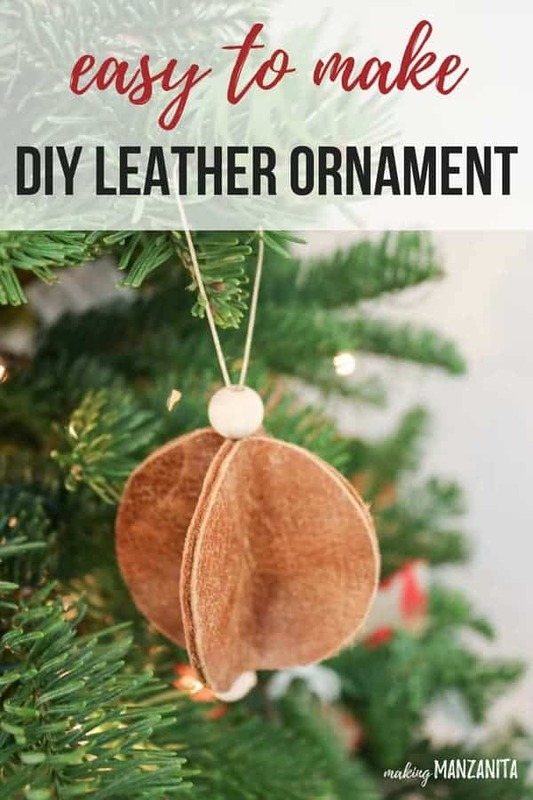 Making these DIY leather ornaments is pretty addicting and if I had more time right now, I’d probably keep going…but alas December is always a bit of a crazy month, so we’ll stop at 2 leather ornaments this season. If you’re looking for a Christmas craft that kids can make, you’re in luck. This tutorial is a little more simple than yesterday’s and great for kiddos. 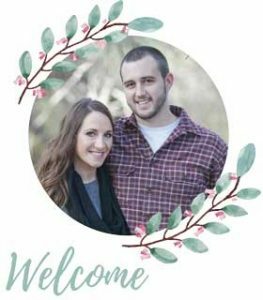 Depending on their age, they may need a little help cutting the perfectly round circle. UPDATE: There’s a replay of my live video tutorial for this project at the end of this post ! Step 1: Trace and cut circles. I used the bottom of my twine holder to trace a circle on the backside of my leather. 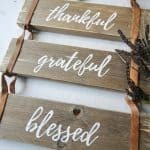 It is about 2.5 inches wide, similar to the size of the drinking glass so you could use something from your kitchen that is perfectly round or something else you have nearby. Trace and cut 4 or more circles. I used four for my ornament, but I got to thinking after I was done that you could probably do 5 or even 6 for different look too! Be sure to use a pencil to trace, even if it is less visible. 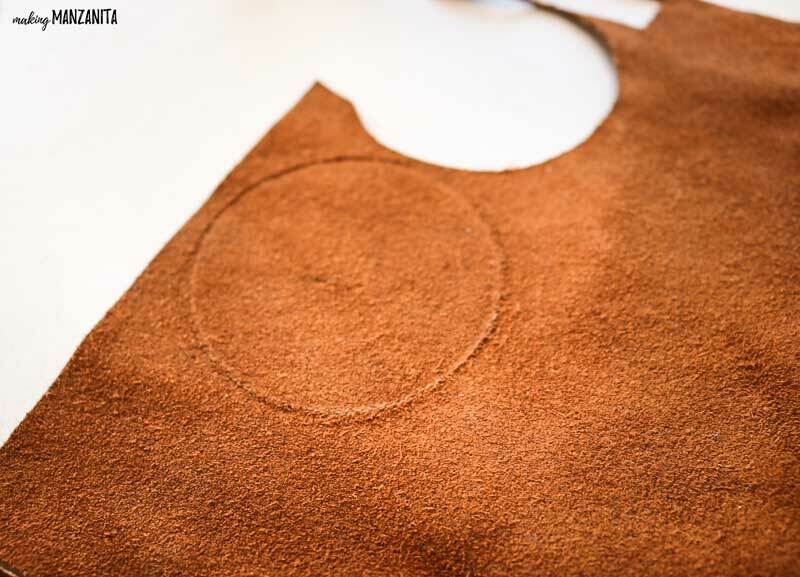 The pencil should, however, brush up the leather a bit as shown in the photo above so you have a guide line to cut. If you use something more obvious, like a sharpie, you’ll be able to see the lines later. Step 2: String bead on twine. 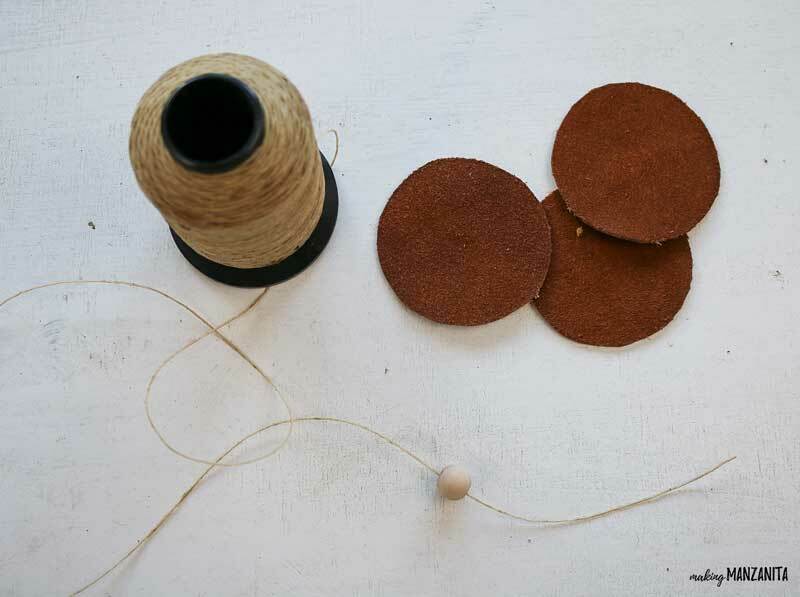 Take your waxed twine and string one wood bead on the string. This will be the string that goes through the middle of the ornament. You’ll see in the next picture how to just bring both ends of the twine up through the middle of the ornament. Step 3: Glue circles together. 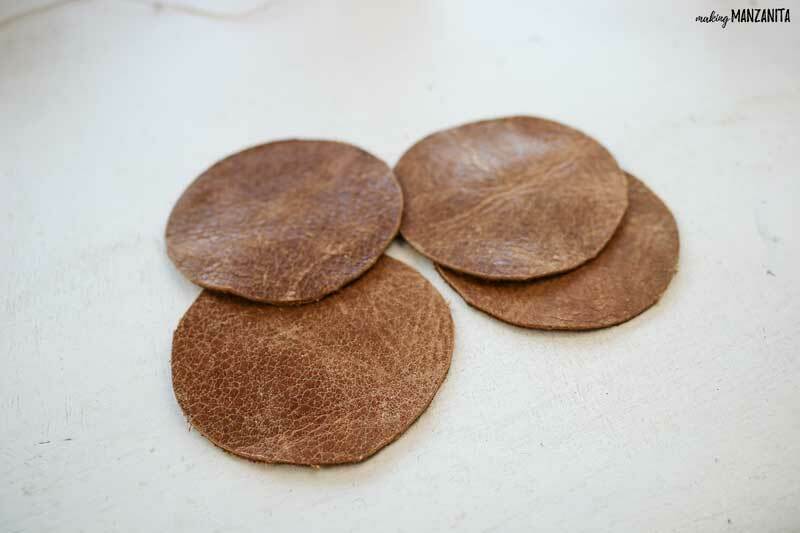 Using 3-in-1 craft glue (or a leather glue if you have that), start gluing the 4 circle pieces together. 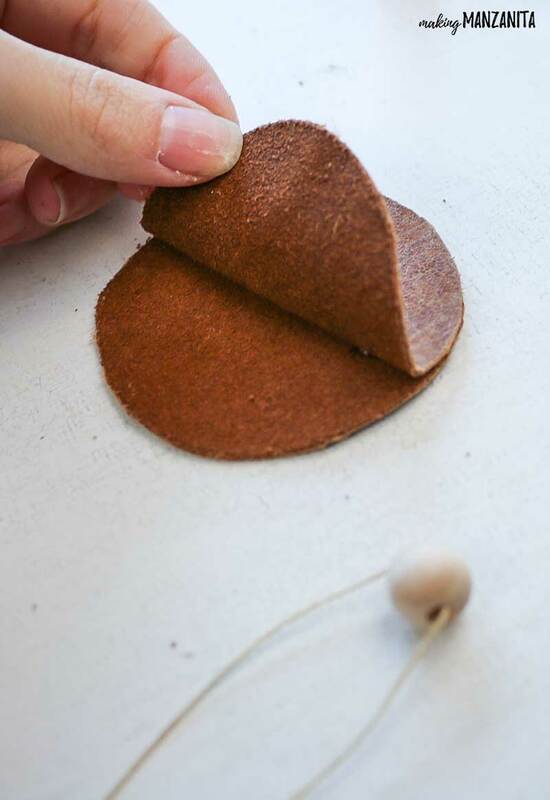 Fold the circle in half and apply glue to just one half. Press half of another circle on top of the glue. Keep the string in the middle of the circles and continue to make your way around the ornament until all four circle pieces are glued together in a ball formation. Step 4: Add top bead & tie hanger. 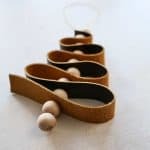 Add more wooden bead to the twine poking out the top of the leather Christmas ornament and then simply tie the pieces together to make an ornament hanger. 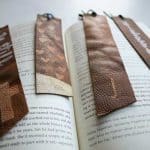 Aren’t these easy leather Christmas ornaments so stinkin’ cute? I love the rustic look of the leather mixed with the modern farmhouse feel of the ornament. 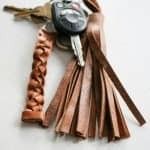 These easy leather Christmas ornaments only take a few minutes to whip up, so you can make a whole bunch to cover your Christmas tree or give to your friends and family as handmade Christmas gifts. 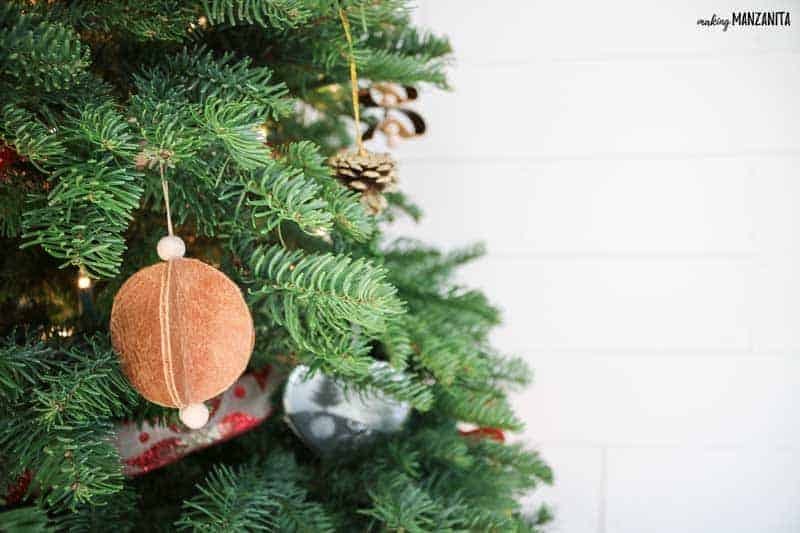 CLICK HERE TO SEE HOW TO MAKE THE CHRISTMAS TREE LEATHER ORNAMENT (on the right in the photo below)!